Veterinary medicine continues to be an extremely desirable career path despite the high educational cost and the difficulty of gaining entrance to a veterinary program. After all, with more Americans adopting pets into their families, the demand for vets is bound to increase. According to the U.S. Board of Labor Statistics, growth for this field is expected to be 19% between 2016 and 2026 — much higher than the average for most careers. But the extremely limited number of places in U.S. based veterinary programs has pushed many students to look elsewhere to study. In fact, many students are going abroad to international schools that offer veterinary training, sparking strong interest in a few prominent Caribbean veterinary schools. Caribbean vet schools have become a popular option for many American students unable to gain entrance to a U.S. school of veterinary medicine, and since 2011 there have been two AVMA approved options. They are listed under "West Indies" in the list of accredited foreign schools on the AVMA website. Ross University School of Veterinary Medicine (founded in 1982) is located on St. Kitts in the West Indies. Students complete seven semesters at St. Kitts and can then completed the remaining three semesters of clinical training at an AVMA-affiliated school in the U.S., Canada or other international local. The program is accredited by the American Veterinary Medical Association and, as such, its graduates are not required to take foreign licensure exams to practice in the United States, Canada or Puerto Rico. Ross University was the first Caribbean veterinary program to achieve AVMA accreditation in March 2011. The school will be under a comprehensive re-evaluation for accreditation purposes in 2025. According to the school's website, the fees per semester were $20,304 for students starting the first semester on or after Sept. 1, 2018. This does not include other fees such as health insurance, visa processing, or books or materials. St. George’s University School of Veterinary Medicine (founded in 1999) is located on the island of Grenada in the West Indies. The coursework includes three years at SGU followed by a year of clinical training at an AVMA accredited program in the United States, United Kingdom, Ireland, Canada or Australia. The program’s AVMA accredited status ensures students do not have to take foreign graduate exams to practice in the United States. St. George’s University was the second Caribbean veterinary program to become AVMA accredited — in September 2011 — and approximately 160 students graduate from the program each year. Fees at St. George's were $18,949 per term for six preclinical terms in Grenada. Clinical term fees were $22,412 per term for three terms. These fees, as of 2018, do not include additional fees including the cost of books and materials or graduation fees. St. Matthew’s University School of Veterinary Medicine, founded in 1997, is located on the island of Grand Cayman in the Caribbean. The school promotes itself as the most affordable option amongst the Caribbean vet school programs and has very small class sizes to guarantee personal attention. It is not AVMA accredited, but students can become eligible to practice in the U.S. by following PAVE or ECFVG equivalency exam pathways. Tuition and fees for basic sciences were $16,125 per semester as of 2018. Clinical training fees per semester were $24,000. These fees do not include any additional, miscellaneous fees such as health insurance, application fees or graduation fees. Students who attend international vet schools not accredited by the American Veterinary Medical Association (AVMA) must go through additional expenses and testing before becoming eligible to seek a license to practice in the United States. It can take several months — even up to a year or two — to complete these requirements. There are two equivalency exams that can make a graduate of a non-accredited program eligible for U.S. licensing procedures: the Program for the Assessment of Veterinary Education Equivalence (PAVE) and the Educational Commission for Foreign Veterinary Graduates (ECFVG) certification program. The Program for the Assessment of Veterinary Education Equivalence (PAVE) is an equivalency exam for veterinary graduates who attend school outside the United States or Canada. The program is governed by the American Association of Veterinary State Boards. PAVE is not accepted by all states, so a student should investigate the requirements where they intend to seek licensure before enrolling in the program. As of 2018, PAVE was accepted in 42 states as well as Australia and New Zealand. This list continues to be updated as the American Association of Veterinary State Boards (AAVSB) adds more jurisdictions. The steps for PAVE certification may include a credentials verification process, English proficiency testing, a qualifying science examination, and a demonstration and evaluation of clinical proficiency. There are many significant (and non-refundable) fees involved with the testing, including a $1,500 charge for the qualifying science exam and the $375 PAVE application fee. The Educational Commission for Foreign Veterinary Graduates (ECFVG) certification program is an equivalency exam for veterinary graduates of foreign programs. The ECFVG is run by the American Veterinary Medical Association and is accepted by all states and the federal government. It is also accepted by Canada, Australia and New Zealand. The steps for ECFVG certification include credential verification, an English language assessment, a 225-question Basic and Clinical Sciences Examination (BSCE), and a multi-day hands-on Clinical Proficiency Examination (CPE). As of 2014, applicant are required to submit documentation outlining their surgical experience. The ECFVG also involves significant fees for the certification and testing process, including a $1,400 registration fee and a $220 additional fee for the BSCE exam. 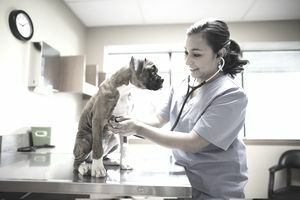 After completing all equivalency requirements, the new veterinarian must also meet all other criteria required for U.S. and Canadian graduates including passing the North American Veterinary Licensing Examination (NAVLE) and any achieving any other state or local licensure requirements. Only upon passing all requirements will a veterinarian be eligible to practice medicine in their state of choice. Once you've passed the exams and obtained your license and other credentials, it will be time to find somewhere to work or get practical training. Remember, passing the equivalency and license exams does not guarantee employment. So it is up to you to try to find a place to work or intern. The AVMA has some great resources for people who are trained abroad to find available careers, internships and residencies.